S I G N & D I G I T A L G R A P H I C S • June 2018 • 53 ous snapshot) was taken quickly, and fortunately the amateur photographer snapped a few extras because it was later needed for publication in a newsletter (see Figure 2B). Start by encircling both eyes on the target image with Photoshop's Lasso tool. Leave some space around the eyes, as in Figure 3. I've selected the eyebrows too, which I can always mask out if I don't need them. They Eyes Have It Copy and paste or drag and drop the eyes to the target document and roughly position them over the underlying eyes. They appear on a separate layer which you'll name "Eyes". 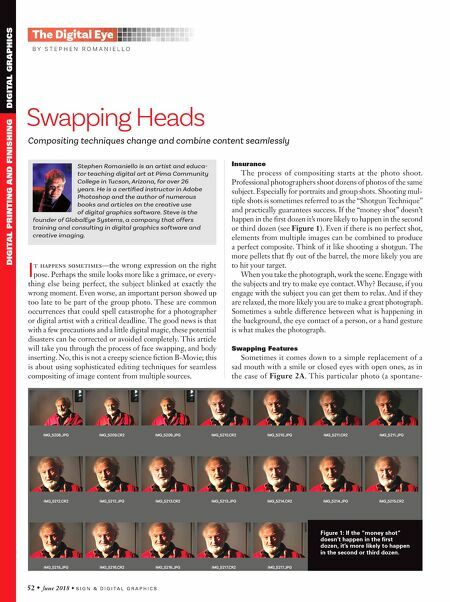 It helps to reduce the opacity of the Eyes layer to between 30 and 50 percent so that the underlying content can be seen to better position and scale the content (see Figure 4). After they are properly in place, increase the opacity to 100 percent. Press the Cmnd (Mac) Cntrl (Win) key and click the Layer thumbnail to select the content. Go to the Layers menu and choose Layer Mask > Reveal Selection. You'll see a layer mask thumbnail in the layers panel. Click on the mask thumbnail to select it (as in Figure 5). Figure 2A, 2B: Sometimes it comes down to a simple replacement of a sad mouth with a smile or closed eyes with open ones. Figure 3: Leave some space around the eyes when selecting them with the lasso tool. 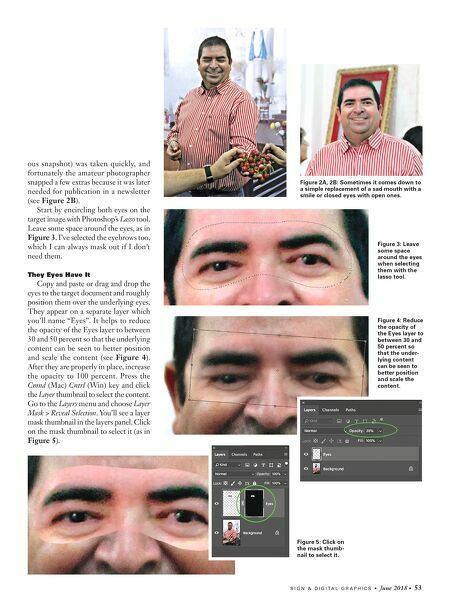 Figure 4: Reduce the opacity of the Eyes layer to between 30 and 50 percent so that the under- lying content can be seen to better position and scale the content. Figure 5: Click on the mask thumb- nail to select it.